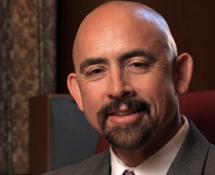 Before being appointed president of WICHE in June 2016, Joe Garcia served as the lieutenant governor of Colorado and as the executive director of the Colorado Department of Higher Education. He had previously served on the WICHE Commission for nine years, including serving as its chair in 2011. Prior to being elected lieutenant governor, Garcia served as president of Colorado State University-Pueblo and as president of Pikes Peak Community College, where he was twice named “President of the Year” by the State Student Advisory Council. Garcia served as a member of the cabinet of Governor Roy Romer and as a White House appointee under President Bill Clinton at the Department of Housing and Urban Development. He also was employed in the private practice of law for 10 years at the law firm of Holme Roberts & Owen, where he became the first Hispanic partner in the 100-year history of the firm. Garcia earned his BS in business at the University of Colorado-Boulder and his JD from Harvard Law School.